When I connect my EOS 600d Camera from Canon with my Mac Book Pro (Mountain Lion 10.8.2), it doesn't get mounted as a drive... Nothing is happening. I googled the problem and was able to get my pictures on to my Mac by using a SD-Card reader. Anyhow, it's not recommended to open the camera every time I want to transfer some pictures and EOS Utility isn't compatible to Mountain Lion. Did anyone come across that problem? You need to update your Canon software. Here is a link to the US Canon web site with the latest software that will work in Mountain Lion. That said, I highly recommend you use a card reader and remove the card from the camera each time you copy files over. Using the Canon software has ALWAYS been a terrible experience for me. It is painfully slow and convoluted. Opening and closing the hatch for the memory card will not damage the camera or memory card unless you are very careless about it. I have done this tens of thousands of times with my cameras and memory cards with no issues at all. Digital cameras are usually not mounted as storage devices. To transfer the photos from the camera, use the Image Capture.app which is under Applications. Once you connect your camera, it'll show up there. In the bottom left, see the triangle button. Here you can select whether Image Capture should open automatically once you connect the camera. I have a Canon 7D & Macbook Pro and have also found this process to be far from seamless. Image Capture doesn't open automatically when connected to Canon SLR' (my 7d or 400d) however it is the best software that I have found for the job. 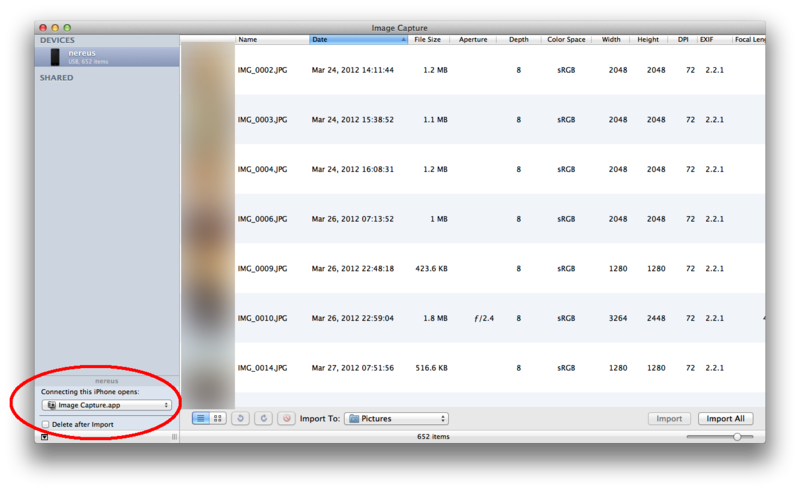 I save the files in an external file structure rather than creating albums and events in iPhoto. I have have found the Kingston SD card reader a worthwhile purchase. Image capture has also crashed a few times when uploading so I never delete the imported photos using the software and do it manually on the SLR once the device has been disconnected. Not the answer you're looking for? Browse other questions tagged mountain-lion camera canon .